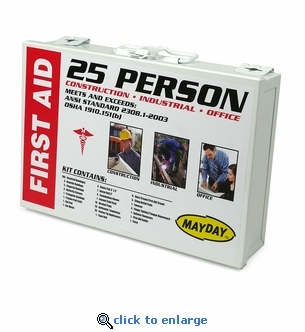 This Mayday 25 person first kit in a metal cabinet contains first aid supplies you’ll need for minor injuries in the workplace. This kit exceeds ANSI Standard 2308.1-2003 and OSHA 1910.151(b). The sturdy metal case can be mounted to the wall in a convenient location to assure quick accessibility. Recommended for construction sites, industrial zones, factories and offices. Make sure your workplace is prepared to render first aid in the event of a minor accident. 1 Metal Cabinet - 10 7/8" x 7 1/2" x 2 1/2"